The Telerik RadTreeView control enhances further your application's capabilities through the rich drag-and-drop functionality. Your users can create and re-order any hierarchical structures and easily perform various drag-and-drop operations. Enable drag and drop behavior declaratively and programmatically. 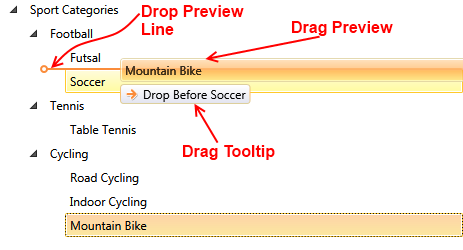 Explain the visual elements of the drag and drop operation. Enable drag of multiple nodes declaratively and programmatically. Disable drop operation on specific item declaratively and programmatically. Disable drag preview declaratively and programmatically. Disable drag tooltip declaratively and programmatically. Disable drop preview line declaratively and programmatically. Using DragDropManager events to manage the drag and drop process. Drag and drop between treeviews. Drag and drop between treeview and other controls (TextBox, DataGrid). 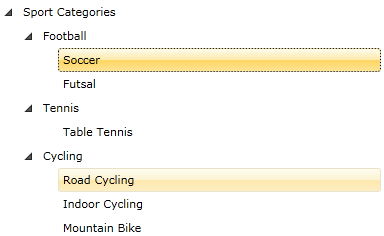 With the Q2 2013 release we extended the RadTreeView DragDrop built-in implementation to also use the DragDropManager. For the moment the old RadDragAndDropManager logic will be kept but you need to set the TreeViewSettings.DragDropExecutionMode property to Legacy in order to enable it. However, it is important to note that we will remove this Legacy DragDropExecutionMode as soon as the RadDragAndDropManager is removed. The drag and drop behavior can be enabled in the code-behind. In order to do that you need to set the IsDragDropEnabled property of an instance of the RadTreeView class to True. If the treeview is bound, it is best to be bound to an ObservableCollection. Otherwise the result of the drag and drop will not be visible. Also the ItemsSource collection of the items to which the leaves nodes of the treeview are bound, need to be initialized as well, otherwise drops in them will not be possible. If the ItemSource of the RadTreeView (RadTreeViewItem) is not an IList, then the drop operation is not allowed. Once enabled, dragging behavior by default allows items to be dropped on other items and between items. A line between the Items will be displayed briefly as a visual indicator that the node can be dropped in the location of the line. See the next figure. 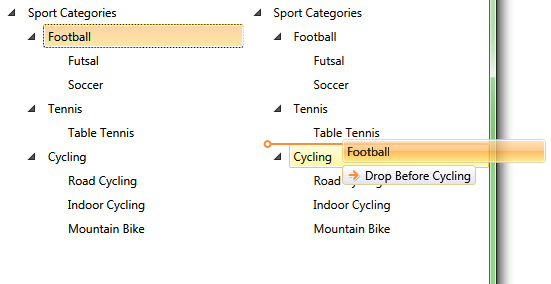 More details about how to disable each one of the elements you will find later in the topic. Dragging multiple nodes at once can be enabled in the code-behind. In order to do so, you need to set the SelectionMode property of an instance of the RadTreeView class to Multiple or Extended. You can further tailor the drag and drop behavior per Node by setting the boolean RadTreeViewItem property IsDropAllowed. In order to disable drop operation on specific item you should set the IsDropAllowed property of an instance of the RadTreeViewItem class to False. By default each visual element (drag preview, drop preview line, drag tooltip) of the drag and drop operation is enabled. In the next several sections you will see how to disable each one of them. The same operation can be done in the code-behind. In order to do that you need to set the IsDragPreviewEnabled property of an instance of the RadTreeView class to False. Here is the result. When you drag treeview items, the drag preview element is no longer visible. The same operation can be done in the code-behind. In order to do that you need to set the IsDragTooltipEnabled property of an instance of the RadTreeView class to False. Here is the result. When you drag treeview items, the drag preview and drag tooltip elements are no longer visible. The same operation can be done in the code-behind. In order to do that you need to set the IsDropPreviewLineEnabled property of an instance of the RadTreeView class to False. Here is the result. When you drag treeview items, all visual elements are disabled (hidden). Please note that these events are only available with the Legacy DragDropExecutionMode which will be removed. This is why we highly recommend that you use the DragDropExecutionMode.New which since Q2 2014 is the default setting. 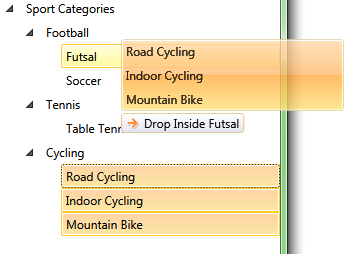 Its events are described in the Using DragDropManager events to manage the drag and drop process section. The RadTreeView actually uses and handles the DragDrop events of the RadDragAndDropManager. In fact, they can be used for managing the drag and drop process, too. You should use the AddHandler() method of the treeview. When RadTreeView detects a valid drag operation, it generates a PreviewDragStarted and DragStarted routed events. When a valid drop operation (the selected Item is dropped onto another Item or in between Items) is detected, a PreviewDragEnded and DragEnded events are generated. Both PreviewDragStarted and PreviewDragEnded events can be cancelled by setting the Handled property of the event argument to True in the event handler. Handling the PreviewDragStarted event will cancel the drag operation. This is equivalent to set the RadTreeView's IsDragDropEnabled property to False. 'e.Handled = True' - where 'e' is the RadTreeViewDragEventArgs class passed as an argument of the event handler. Handling the PreviewDragEnded event will cancel the drop operation. This is useful, when you want to cancel adding/removing items from the RadTreeView's ItemsCollection. 'e.Handled = True' - where 'e' is the RadTreeViewDragEventArgs class passed as an argument of the event handler. DraggedItems- a collection of Items being dragged (this is useful when multi-selection is enabled - SelectionMode property of the RadTreeView is set to True). DropPosition- indicates the relationship of the Items being dropped and can be a DropPosition enumeration value After, Below or Inside. TargetDropItem- the Item being dragged to. IsCanceled- boolean property, indicates whether the drag and drop operation is cancelled or not. // Get the dragged items. // Get the drop position. 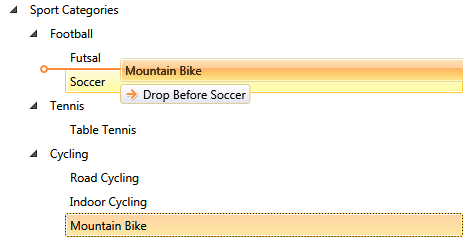 With Q2 2012 you can use the DragDropManager events to customize the new DragDrop logic of RadTreeView. DragInitialize - The DragInitialize event occurs when an object is about to be dragged. Therefore the RadTreeView handles it internally to set all needed information regarding the drag - the DraggedItems, the DragVisual and the settings of the operation. This information is wrapped in a TreeViewDragDropOptions object and passed to the arguments of the event. GiveFeedback - This event is continuously fired by the drag source during a drag-and-drop operation. Therefore the RadTreeView handles it internally to apply an Arrow cursor during the drag operation. DragOver - This event occurs continuously while an object is dragged (moved) within the drop target's boundary. Therefore the RadTreeView handles it internally to update the DropPreview Line position as well as the current action and position of the drop. DragLeave - This event occurs when an object is dragged out of the drop target's boundary. Therefore the RadTreeView handles it internally to update the DropPreview Line position as well as the current action and position of the drop. Drop - This event occurs when an object is dropped on the drop target. Therefore the RadTreeView handles it internally to implement the drop operation. DragDropCompleted - This event occurs when an object is dropped on the drop target and is used to notify the source that the drag operation is over. Therefore the RadTreeView handles it internally to update its state and items based on the DropAction type of a successful drop. As RadTreeView handles internally the above DragDropManager events, in order to invoke a custom handler, you need to explicitly specify that you're adding a handler that should be invoked even for already handled events. This is done through the last - bool argument of the DragDropManager.Add[Event]Handler extension method. You can find more information about the DragDropManager events in the Events tutorial. When a drag operation starts, RadTreeView creates an object of type TreeViewDragDropOptions and passes it as the Data of the drag. You can extract that object through the event arguments of the DragDropManager events. Copy - dragged items will be added to the destination and will not be removed from the source. Move - dragged items will be added to the destination and will be removed from the source. Delete - dragged items will not be added to the destination and will be removed from the source. None - dragged items will not be added to the destination and will not be removed from the source. If the drop operation is allowed, the default DropAction is Move. And in order to change this logic, it would be best to define a custom DragOverHandler and customize the DropAction value in it. However, please note that you need to handle the DragDropManager DragOver event of the RadTreeView that is acting as a destination for the drop operation. Before - indicates that the dragged items will be dropped before the target. Inside - indicates that the dragged items will be dropped inside the target. After - indicates that the dragged items will be dropped after the target. Undefined - indicates that the drop position of the item is not yet determined. DragVisual - Gets or sets a visual representation of the drag/drop operation state. By default a TreeViewDragVisual object is created automatically. DraggedItems - Gets an IEnumerable collection populated with the dragged items. DragSourceItem - Gets the RadTreeViewItem which has started the current drag/drop operation. This property is initialized when the drag operation starts and it will be null if the RadTreeView control is not the source of the operation. DropTargetItem - Gets the RadTreeViewItem laying under the drop point. This property is initialized while dragging directly over a RadTreeViewItem and it is set to null as soon as the drag leaves the bounds of the RadTreeViewItem. DropTargetTree - Gets the RadTreeView laying under the drop point. This property is initialized while dragging directly over a RadTreeView and it is set to null as soon as the drag leaves the bounds of the RadTreeView. The TreeViewDragDropOptions exposes one method - UpdateDragVisual(). It should be used to update the DragVisual property value in case it is of type TreeViewDragVisual. You need to call the TreeViewDragDropOptions UpdateDragVisual() method when the changes in the values of the TreeViewDragDropOptions members should be reflected in the DragVisual. For instance, if you need to disable a drag operation and you set the TreeViewDragDropOptions DropAction value to None, the visual feedback of the operation won't reflect that change although the drop operation will be forbidden. And in order to make the RadTreeView instance update its DragVisual to display a DropImpossible indicator, you need to invoke the UpdateDragVisual() method. With Q2 2013, if you use the New TreeViewSettings.DragDropExecutionMode, then you will be able to take advantage of the built-in auto-scrolling functionality implemented in RadTreeView. Moreover, there are a set pf properties exposed to allow you to customize the auto-scrolling functionality to better fit your needs. ScrollingSettingsBehavior.IsEnabled - gets or sets a bool value indicating whether the auto-scrolling behavior is enabled. ScrollingSettingsBehavior.ScrollStep - gets or sets a double value defining the scrolling offset used to define a single step during the scroll operation. ScrollingSettingsBehavior.ScrollStepTime - gets or sets a TimeSpan value defining the timeout period between two scroll steps. The Telerik RadTreeView allows you to perform drag and drop between treeviews - this is a default behavior. You can use the built-in RadTreeView DragDrop when implementing drag-drop between the tree and other controls such as a ListBox. For more information you can read the topic How To Implement Drag and Drop Between TreeView and ListBox.